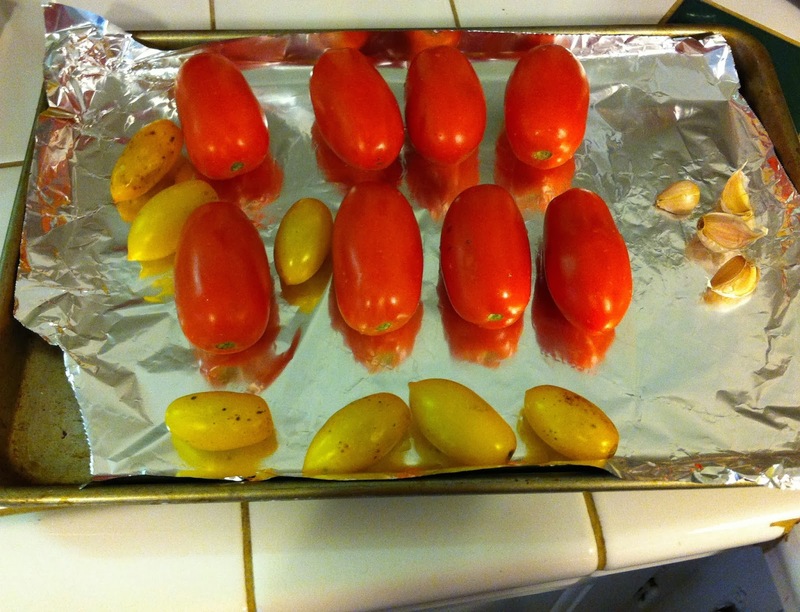 Take 8 Roma tomatoes, or whatever kind you have on hand, and about 4 cloves of garlic and throw ’em on a foil lined pan. I’m a terrible foil ripper, as you can tell by the picture. Plastic Wrap, however, is my worst enemy. I also threw in some little yellows ones my dad had sent back with me a week or so ago. Drizzle with olive oil and roast in a 425 degree oven until the peel on the tomatoes is cracked and they are starting to turn slightly black. Make sure you leave the garlic in the peel, just smoosh it a little bit. 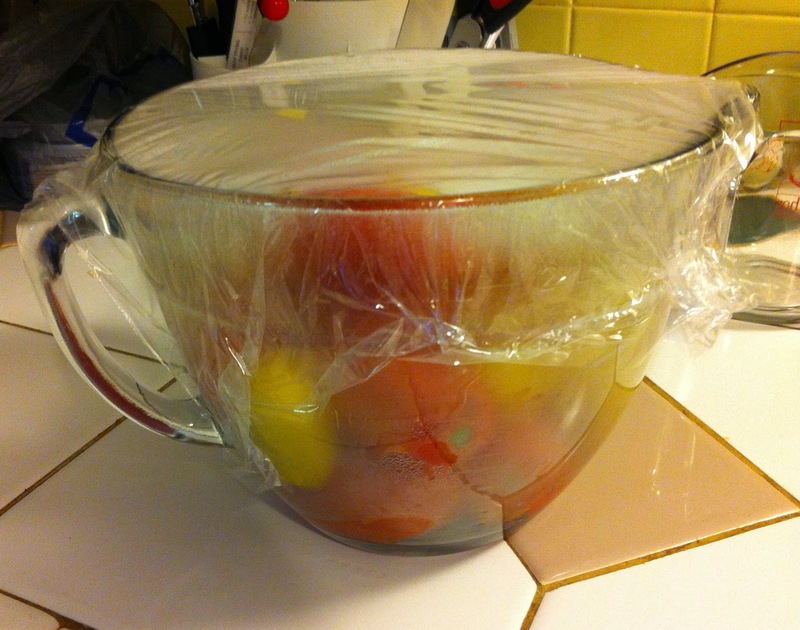 Once the peel on the tomatoes is cracked and has begun to turn, throw them in a bowl and cover with plastic wrap. FYI – I won this battle with the plastic wrap. Me- 5, Plastic Wrap – 1,597. 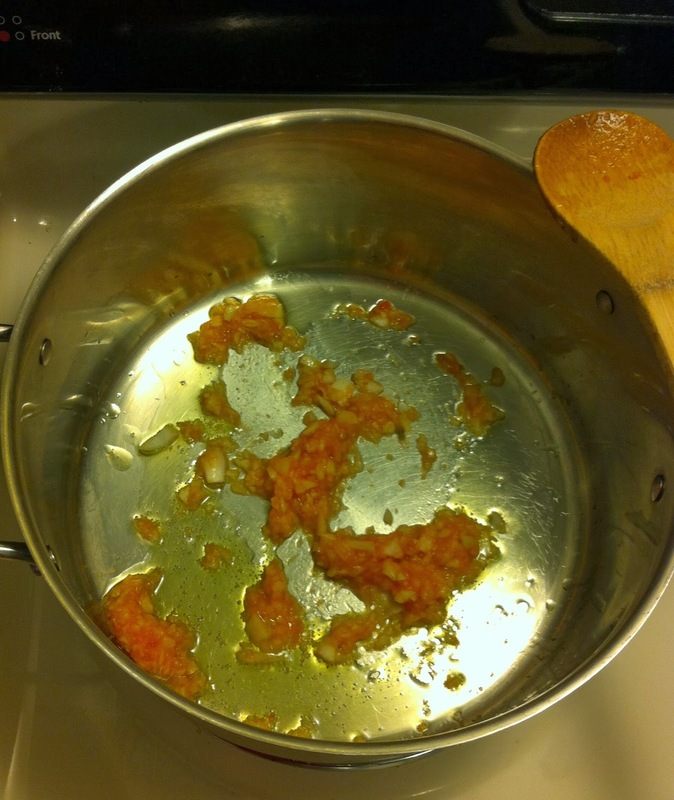 While you are waiting for the tomatoes to “sweat”, peel and finely dice half an onion. Pour a tablespoon of olive oil in a big ole pot and cook the onions until they are nice and translucent. Ignore the redness in my onions. I forgot to do this step before processing the tomatoes. Thus, my onions look as though they are bleeding. 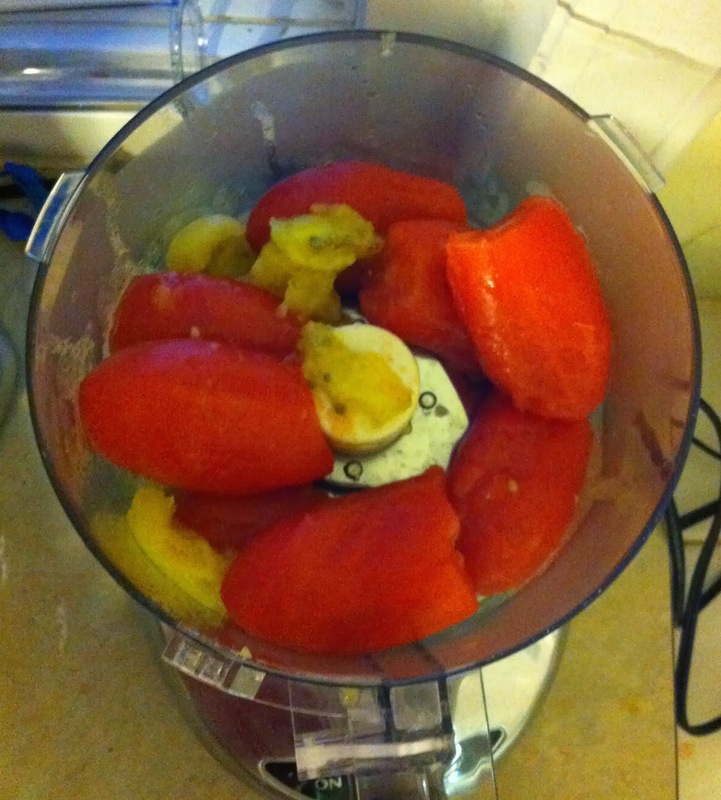 Once the tomatoes are good and sweaty, peel ’em and throw them and the peeled garlic in a food processor. Now, process..until it’s all nice and smooth. 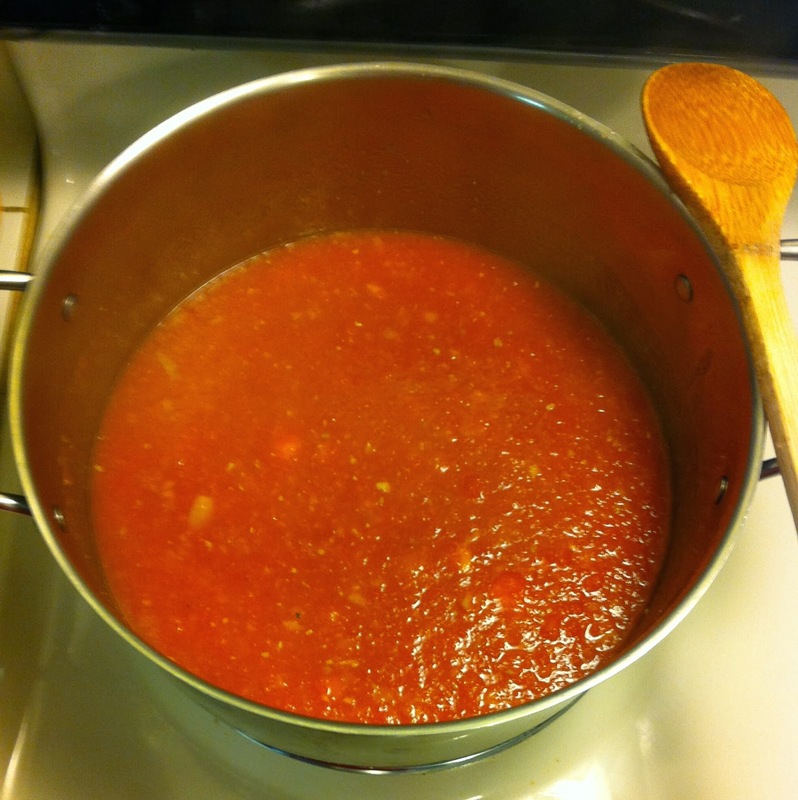 Pour the pureed tomatoes and garlic, as well as any reserved juices from the bowl the tomatoes sweated in, into the pot with the onions. Add 1 cup of chicken stock. Bring to a boil then turn down heat to a simmer. 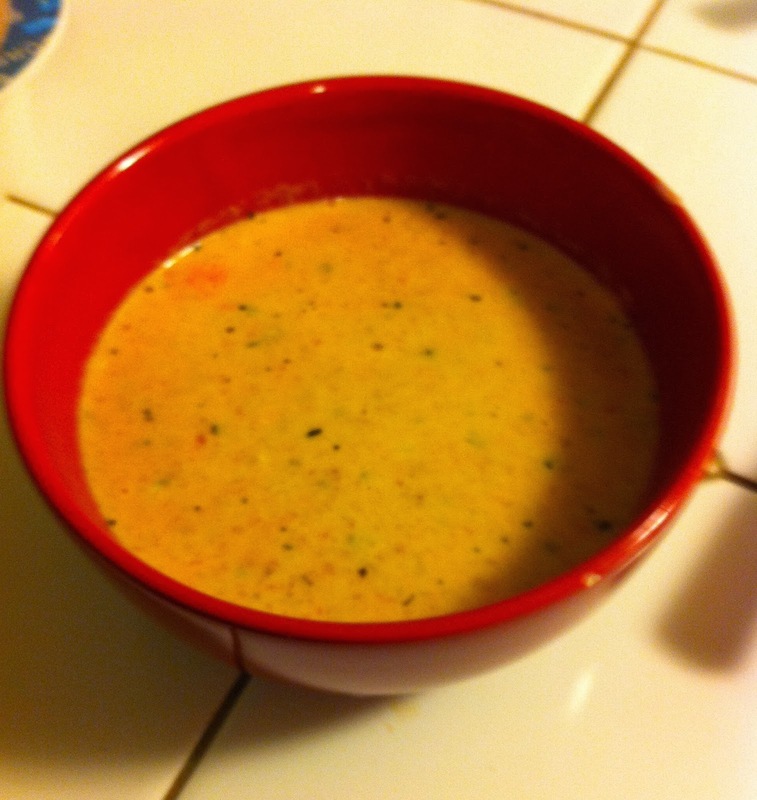 Add 1/2 cup of heavy cream, salt and pepper to taste, and 1 teaspoon of dried basil. Simmer for about 20 minutes. Ta-Da! Had I had oyster crackers on hand I would have garnished the soup with some, but alas, I did not. But if you do, then by all means, enjoy those bad boys. For dessert I decided to make the kids…and myself…poor man smores. I don’t know why I call them this. My dad made them for us all the time when we were kids and I never heard anybody call them that. Call them what you like, they are delicious. Grab some saltine crackers, peanut butter and marshmallows. 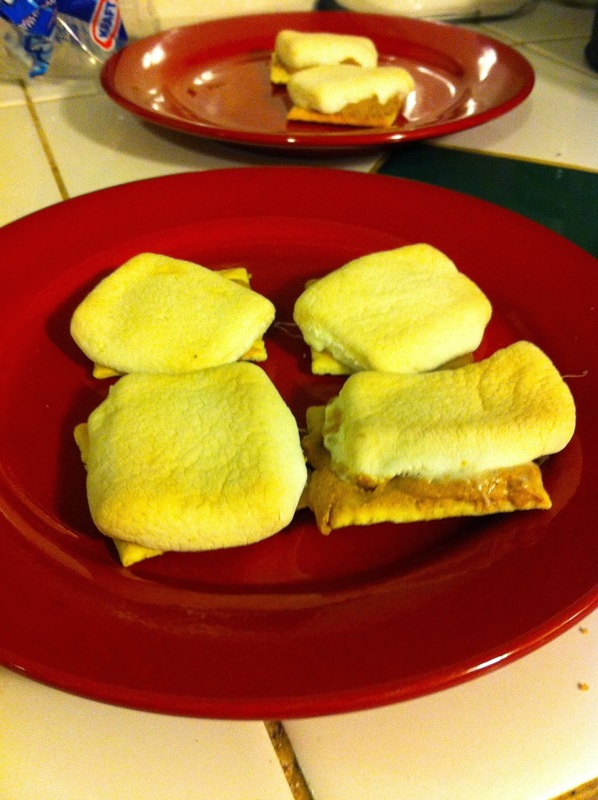 Spread the peanut butter on the cracker and top with a marshmallow. I ran out of peanut butter and had to use Trader Joe’s Cookie Butter. I choose for these to be mine. And let me tell you it took the Poor Man Smore to a whole new level of yummy goodness. After they are all assembled, throw into a 350 degree oven until marshmallows are slightly browned or until the level of browness you like on your marshmallows has been achieved. Warning: Please, for the love of your taste buds, let these suckers cool off before biting into one. Hot peanut butter and marshmallow make a deadly hot combination and you might not be able to taste anything for 2-3 weeks afterwards if you don’t. I speak from experience people. Heed the warning. And enjoy!